The Bulls have offered forwards Taj Gibson, Nikola Mirotic, and rookie Doug McDermott in a trade package for Minnesota Timberwolves star Kevin Love, according to multiple reports: The package is extremely intriguing to the Timberwolves, but there is a catch; it cannot be completed for another 29 days because McDermott and Mirotic signed their rookie contracts Tuesday. NBA rules prohibit rookies from being traded within the first 30 days of inking their rookie deals. According to a Timberwolves source, the Bulls made a “significant offer” Wednesday morning for Kevin Love, and it’s an offer that is being “heavily considered.” The source said that the two headlining names in the package were Taj Gibson and Doug McDermott, “as well as a few other assets.” There was a report that Nikola Mirotic was also involved, but the source could not confirm that.The news comes as the Cavaliers continue to push for a deal involving Andrew Wiggins, Anthony Bennett, and a first round pick, and as Boston is reportedly considering backing out of pursuit of Love. Multiple teams including Boston are said to be working as a third team to facilitate a deal.It’s suspicious that the leak is coming from the Timberwolves, who have been consistently leaking offers which has increased the bids for the All-Star, establishing leverage with Minnesota after Golden State had balked at including outstanding role player Klay Thompson in talks. There have been so many leaks in these talks that it’s been reported various executives have been displeased with how Minnesota has handled it. But considering how much better the offers have gotten for Love over the past month, it’s a pretty good tactic.The only expiring contract the Bulls have is Mike Dunleavy’s $5 million, and the Wolves are looking to move contracts of Kevin Martin and J.J. Barea in the deal as well. The Bulls’ offer likely isn’t the best one they’re going to get, but it does show how much better the offers get as each day goes by. Boozer to Lakers via amnesty auction. LOS ANGELES—The Los Angeles Lakers have won the amnesty auction for Carlos Boozer, who was waived by the Bulls using the amnesty provision. That means the Lakers outbid other teams for Boozer’s services. So… this is a little weird. Boozer is a veteran, and the Lakers did want to put together a decent team next season, but haven’t put the money out to really improve the team. They’ll be fine, probably not good, but slightly competitive. But the addition of Boozer puts a roadblock in front of first-round pick Julius Randle. And that doesn’t make any sense.Boozer effectively is a swap with Pau Gasol, who was signed by the Bulls. That’s a signficant downgrade, but Boozer may honestly be better defensively at this point. (Are ou kidding me?). It’s a cheap option, though, and it gives Kobe Bryant a big he won’t want to punch in th face three times a game. How Boozer fits with the longterm goals of the franchise, and whether he would be a better fit as a roleplayer on a true contender(?) remains to be seen. NOTE—Who ever wrote this needs to get off the pipe!!. Boozer era over as Bulls amnesty the forward. The Bulls’ signing of Pau Gasol was the writing on the wall for the end of the Carlos Boozer era on the West Side. With Joakim Noah and Taj Gibson entrenched in the Bulls’ interior, Gasol and the signing of Nikola Mirotic make it a crowded frontcourt for the Bulls. Boozer commands a high salary next season and the Bulls have decided to pay it to him without having it count against their salary cap number.The Bulls announced on Tuesday that they had used the amnesty clause to remove Boozer from the roster. Boozer enters the amnesty bidding process and could be picked up by the highest bidder for his services. “Carlos epitomized professionalism in everything he did for the Bulls both on the court, and in the community, during his time here in Chicago,” said General Manager Gar Forman. The way the amnesty bidding process works is a team will need to have roughly $1.5 million in salary cap space in order to bid on Boozer. Teams submit their bids without knowing what other teams are offering up in the process. The highest bid claims Boozers and pays him that bid price for next season. If a team has a winning bid of $3 million, they’ll pay Boozer $3 million and that salary will be subtracted from the money the Bulls owes him. In the example of Boozer making $3 million because of the bid, the Bulls would owe him $13.8 million of the $16.8 million he’s slated to make next season.If nobody ends up bidding on Boozer, he’ll become an unrestricted free agent and will be free to sign with any team. Yahoo Sports’ Adrian Wojnarowski has Atlanta and Charlotte as early possibilities for Boozer’s next destination. Boozer left the Utah Jazz back in 2010, agreeing to a five-year, $75 million deal to join the Bulls. In four seasons with the Bulls, he averaged 15.5 points and 9.0 rebounds. The Bulls finalizing an agreement with 7-foot All-Star Pau Gasol. The 34-year-old Spaniard tweeted that he meditated a lot on his decision, which included him turning down two years and $23 million from the Lakers and overtures from the Thunder, Spurs and Knicks.Gasol, who likely will keep Gibson in a sixth man role, has averaged 18.3 points and 9.2 rebounds in 13 seasons. Nikola Mirotic and the Bulls have agreed to a three-year, $17 million contract, according to Yahoo Sports’ Adrian Wojnarowski.The Bulls acquired Mirotic on draft day in 2011, when he was selected No. 23, and since then he’s been starring for Real Madrid. The sweet-shooting forward won MVP of the Spanish ACB in 2013 and MVP of the Spanish Cup in 2014.It’s been assumed that Mirotic would come over since a buyout was reportedly reached with Real Madrid earlier this month.Adding Mirotic, a healthy Derrick Rose, Pau Gasol and Doug McDermott means the Bulls offense has a chance to be much, much better than it was last season. The Bulls ranked 28th in offensive efficiency in 2013-2014. The Chicago Tribune reports that the Bulls have reached an agreement with point guard Kirk Hinrich for what is believed to be the Room Exception, starting around $2 million per year for as many as two years.The Bulls have agreed to terms with guard Kirk Hinrich, according to league sources. Hinrich, who has spent nine of his 11 NBA seasons with the Bulls, averaged 9.1 points and 3.9 assists in 73 games last season. He is a favorite of management and coach Tom Thibodeau.The Bulls view him as an ideal complement for Derrick Rose because he can take defensive and ball-handling responsibilites off Rose’s plate. Free agent point guard D.J. Augustin has agreed to a two-year, $6 million deal with the Detroit Pistons, according to Yahoo Sports’ Adrian Wojnarowski.The Pistons will be Augustin’s fifth team in four years. After a disappointing 2012-2013 season with the Indiana Pacers, he was waived by the Toronto Raptors in December. The Bulls then picked him up, and he completely turned things around, averaging 14.9 points and five assists in 30 minutes per game earned himself this contract.Detroit will presumably use him as a backup behind Brandon Jennings, and at that value this is a solid signing in a vacuum. The Pistons have had a bit of a weird offseason so far, though, with this and the three-year, $19 million Jodie Meeks deal not fitting the usual mold for a rebuilding team. Down goes the Hiami Meat. James back to Cavs. Melo re-sign$ with Knick$. CLEVELAND—LeBron James is going back to Cleveland, agreeing to join the Cavaliers franchise that drafted him in 2003, he announced in a story on Sports Illustrated.Four years and three days after The Decision aired, James is leaving the Miami Heat, choosing to join an up-and-coming Cleveland team rather than stick with the one that has been to the NBA Finals every year since he arrived. James won the NBA championship and the Most Valuable Player award in 2012 and 2013, and disappointingly lost to the Dallas Mavericks and San Antonio Spurs in 2010 and 2014, respectively. With improved three-point accuracy and a more developed post game, he will return to the Cavaliers a better player than he was when he left, an amazing feat considering he registered a PER of 31.7 in 2008-09 and 31.1 in 2009-2010, two of the best individual marks in league history. Miami’s lack of depth, youth and athleticism was exposed against the Spurs, but it was still an elite team. In Cleveland, James’ chances of winning another title next season might not be as great, but there is no shortage of young, talented players. He will team with fellow No. 1 overall picks Kyrie Irving, Anthony Bennett and Andrew Wiggins, as well as recent top-five selections Tristan Thompson and Dion Waiters. James will also reunite with Anderson Varejao, and the Cavs reportedly are trying to acquire some of the sharpshooters who spread the floor for him with the Heat. There’s also the whole Kevin Love thing. In the story, an as-told-to with SI’s Lee Jenkins, James addressed his decision at length, including Cavs owner Dan Gilbert’s infamous letter. 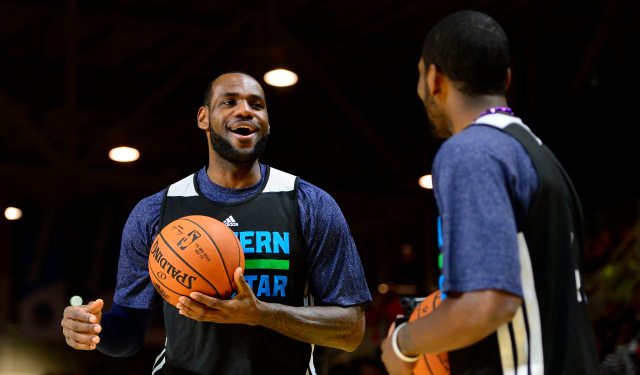 James focused on his Northeast Ohio roots, thanked the Heat organization and said he had the responsibility to lead. He’ll also lead the NBA into a new era, where Cleveland is once again a powerhouse. 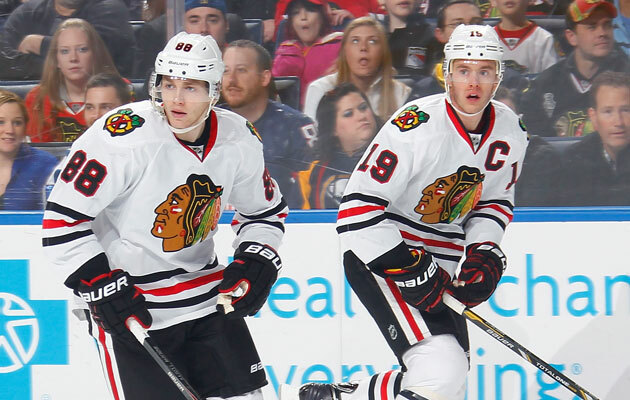 Toews and Kane get eight year extensions with Blackhawks. The Blackhawks announced that their dynamic forward duo of Jonathan Toews and Patrick Kane has signed identical eight-year extensions worth a reported $84 million each to remain with the club. Both had contracts set to expire after the 2014-15 season. Each deal comes with identical $10.5 million cap hits, which at this point will be the highest in the league when the deals begin in the 2015-16 season and are the first to surpass $10 million in the cap era.Selected in back-to-back drafts, Toews and Kane joined the Blackhawks in the 2007-08 season and immediately helped to turn around the fortunes of a franchise that had long been irrelevant in the NHL.Over their time with the Hawks, each has won a Conn Smythe Trophy while leading the Blackhawks to Stanley Cup titles in 2010 and ’13. Think the organization is a bit excited about them sticking around for a while longer? Toews, the team’s pick at No. 3 overall in the 2006 NHL Entry Draft, has been captain since 2008. He has 440 points in 484 games with the Blackhawks. At 26 years old, he has built a reputation as one of the league’s best two-way players and is considered by many among the five best in the league overall. He won the Selke Trophy in 2012-13 as the league’s top defensive forward and was the second-youngest player in NHL history to win the Conn Smythe as playoff MVP in 2010.Toews has 81 points in 94 career playoff games.Kane, the No. 1 overall pick in 2007, has grown into one of the most exciting talents in the NHL. At just 25, he already has 493 points in 515 NHL games and is on pace to challenge Mike Modano for the highest-scoring American-born player in NHL history. This long-term deal might be able to help that. He was the Conn Smythe winner in 2013 as the Blackhawks claimed their second Stanley Cup title in four seasons. He also won the Calder Memorial Trophy as the league’s rookie of the year in 2008.Kane has been a dynamic scorer, particularly in the playoffs with 91 points in 94 postseason contests.Both are two-time Olympians, with Toews winning gold twice with Canada and Kane claiming silver in 2010 with the US.The expensive deals signify a new era under the salary cap. Though the 2014-15 cap ceiling didn’t go as high this season as previously predicted, falling in at $69 million, continual boosts in revenue suggest the number will climb. It should surpass the $70 million mark with ease in 2015-16.The deals may require some maneuvering under the cap for the Hawks over the next few years, but it was vital to the organization to retain their top two players for the foreseeable future. Both are still young and still surging into the best years of their career. They’re the guys that are helping the Blackhawks sell out every home game and become one of the league’s TV ratings giants.Initial reports about the asking price from Kane and Toews, who share the same agent — Pat Brisson of CAA — was placed at $12 million. It was unlikely they were going to get that deal, but it was pretty clear they were going to scrape double digits annually.The deals will take Toews to his age 34 season and Kane to his age 33 year, so they may still have a bit left in the tank when these deals wrap up. Both were set to become unrestricted free agents after next season and would have undoubtedly been able to get more under a less restrictive salary cap on the open market.The fact that the duo was able to stay together and continue to make the Hawks an annual Stanley Cup contender apparently was enough to take a (very) slight discount. What this means for the future of the Blackhawks is unclear. They have top defenseman and two-time Norris Trophy winner Duncan Keith under contract until 2023 as well. Goalie Corey Crawford, defensemen Niklas Hjalmarsson and forward Marian Hossa are also on long-term contracts. Patrick Sharp and Bryan Bickell are under contract until 2016-17. The team will also have to re-sign key restricted free agent Brandon Saad after next season. Things are going to get interesting after this season for sure.The good news for the Blackhawks is that they’ve built a rather solid base of prospects through the draft, meaning they should be able to bring in players on affordable entry-level deals to help fill roles as the Kane and Toews deals kick in. How these deals impact the rest of the NHL landscape will be interesting as well, but most teams have locked up their biggest stars on long-term deals already. Even so, there will be plenty more seeking major paydays under the new collective bargaining agreement and increasingly rich league. Here comes Mirotic, get ready to BOO Deng IF he signs with Heat for less $$ than Bulls offered him! The Bulls have reportedly reached a buyout agreement with Nikola Mirotic to join the team next season.Of note, that could impact the Bulls’ ability to offer Carmelo Anthony a max contract,not that it would matter since the Bulls have little or no chance of signing him.The forward has been highly regarded since the Bulls drafted him several seasons ago. The move does seem to give credence to the idea that the Bulls are planning on using the amnesty provision on Carlos Boozer.League executives have compared him to Pelicans forward Ryan Anderson. The Miami Heat are recruiting former Bull Luol Deng in free agency, and president Pat Riley will meet with him Saturday in Chicago, according to Yahoo Sports’ Adrian Wojnarowski.Riley will presumably pitch Deng on the idea of taking less money to play for a championship. Deng only once got as far as the Eastern Conference finals during his time with the Bulls, and the 10-year vet would make the Heat the overwhelming favorites to reach the NBA Finals next season, if they are not already. He would be a fantastic complementary player in Miami, who would fit seamlessly into coach Erik Spoelstra’s system on both ends.This is likely the last big payday of his career, though, and the Heat might get priced out. He reportedly does not intend to take “significantly less” to join them. Bulls fans would have someone else to boo loudly each time Deng touches the ball if he’s in a Heat uniform for less money than the Bulls offered him, before the dealt him to Cleveland. The Blackhawks, one of the more cap-strapped teams in the league are adding recent buyout recipient Brad Richards on a one-year, $2 million deal, per multiple reports. The Hawks may have just found the solution for their long needed second-line center. The team’s cap situation and the price Richards signed for makes this one of the biggest surprises of free agency opening up.Richards was a key member of the New York Rangers squad that made it to the Stanley Cup Final this year. He put up 51 points in 82 games this season including 20 goals. Richards has nine 20-plus goal seasons in his career, with 867 points in 982 career games. New York ended up using their last remaining compliance buyout on the remainder of Richards’ nine-year, $60 million contract he signed in the summer of 2011.Even at 34, Richards is an effective player who should do well surrounded by the talent on the West Side. He makes a good team better at a position of need and at a very low cost. Richards likely was willing to take less term and money knowing that he’d go to a contender and knowing the Rangers are still paying him a lot to not play for them.By joining the Hawks on a one-year deal, his new team won’t need to have Richards on the payroll as Jonathan Toews and Patrick Kane’s new contracts kick in. Those haven’t been signed yet, but odds are the Hawks extend both at an extremely high price.The Hawks are now $2.2 million over the salary cap for the 2014-15 season, according to CapGeek.com. That means they likely have to swing a deal to free up the space necessary to bring in Richards. The only question now is, who goes? Even with that in mind, this really couldn’t be a better deal for the Blackhawks for what they’re getting in Richards. Here we go again….into another likely EMPTY try at Free Agency as Melo visit’s the United Center. The source wasn’t speaking for the entire Bulls front office, just a small segment. So there is reason to believe that not all members of the team’s hierarchy shared this opinion.Anthony’s wife would prefer that he re-signs with the Knicks, according to Marc Berman of the New York Post.According to two sources, Anthony’s wife, La La Vasquez, also a Brooklyn native, is very happy in New York and is opposed to Melo leaving the Knicks. He became a free agent for the first time in his career at 12:01 a.m. Tuesday, but Anthony said in a video interview posted last week he’s worried about uprooting his family and 7-year-old son, Kiyan. Bottom line is, this is what happens when you are in “Basketball Hell” by winning too much and getting minimal help in the draft and nothing batter than a Carlos Boozer,Ron Mercer and Eddie Robinson via Free Agency.